A = adenine; C = cytosine; G = guanine; ND1–ND5 = NADH dehydrogenase/complex I subunits 1–5; T = thymine. 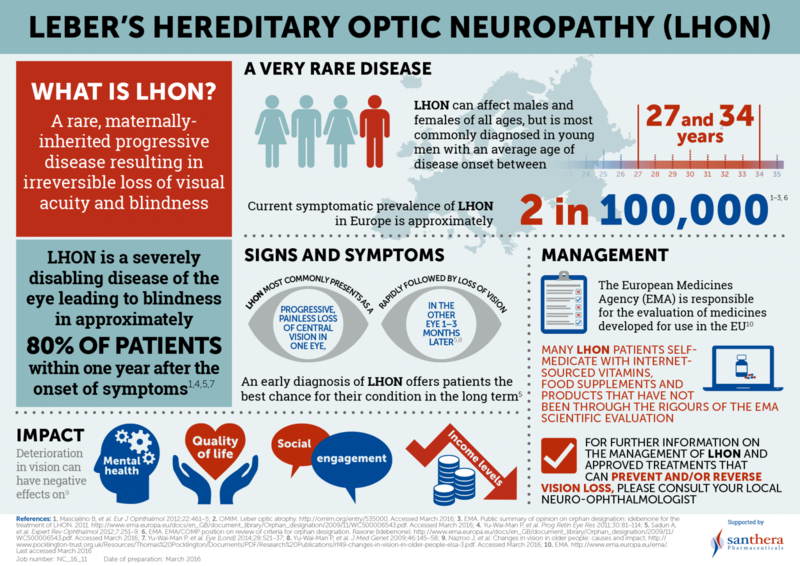 The following infographic outlines some key facts about LHON. Feel free to download this and share. Sadun AA, et al. Expert Rev Ophthalmol 2012; 7:251–259. Yu-Wai-Man P, et al. J Med Genet 2009; 46:145–148. OMIM. Leber Optic Atrophy. 2012. http://omim.org/entry/535000. Accessed September 2015. Kirkman MA, et al. Invest Ophthalmol Vis Sci 2009; 50:3112–3115. Köberlein J, et al. BMJ Open 2013; 3:e003471. Raxone SmPC, September 2015. Available: here. Accessed December 2015. Metz G, et al. ARVO 2014 poster (Abstract 6206). Carelli V, et al. Brain 2011; 134:e188. Gueven N. Biol Med 2014; 6(S3):1–6. Newman NJ. Nat Rev Neurol 2012; 8:545–556. Yu-Wai-Man P, et al. Prog Retin Eye Res 2011; 30: 81–114. Johns DR & Colby KA. Seminars in Ophthalmology 2002; 17:33–38. Yu-Wai-Man P, et al. Eye (Lond) 2014; 28:521–537. Mascialino B, et al. Eur J Ophthalmol 2012; 22:461–465.